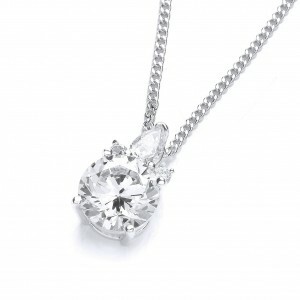 Timeless and elegant, this stunningly simple pendant is the perfect was to add understated glamour. Hand set with pristine brilliant-cut and pear cubic zirconias, and exquisitely suspended on a curb chain, this will add sparkle to the simplest of outfits. Chain length is 40cm with a 5cm extender chain. Matching earrings (CZE997) also available.